I love white chicken chili. I have tried about five different recipes for it and this is one of the best. In a large saucepan, sauté chicken, onion and garlic powder in oil until chicken is no longer pink. Reduce heat; simmer uncovered, for 30 minutes. This will thicken the Chilli and bring out all the wonderful flavor. Remove from heat; stir in sour cream and cream. Serve immediately. I found that this recipe can get spicy if you put to much cayenne pepper. So go easy on the cayenne pepper if you want to make the Chilli milder. If you are like me and like a little spice in your life add a pinch more. Let me know how you like it in the comments below, This is supper easy to make and I know you and your family will love it. 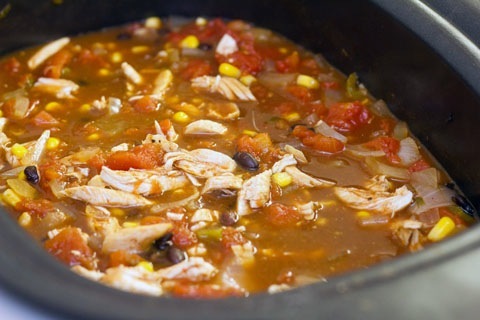 This recipe consists of opening cans and pouring them in the Crock-Pot and as a bonus it tastes amazing. It cooks for four hours so it is perfect for putting on before you go to Church or four hours before dinner. Thank you Shelise Brown Thompson for sharing this wonderful recipe with me. Put in Crock Pot and cook on low for four hours (or until chicken is cooked). Take cooked chicken out, shred, and put back in soup. Top with sour cream, cheese, or guacamole.